Researchers, public health advocates, and healthcare professionals are among those who have been pushing for an increase in the public’s whole grain intake. Americans are increasingly aware of their “whole grain gap” and are trying to incorporate grains into their diet more often. In addition, key players in the foodscape, including the food industry, the media, supermarkets, and restaurants, have clearly heard the call. Consider that there are more than 15-fold more new whole grain products in the marketplace today compared with one decade ago. As RDs, we want our clients to reap the health benefits of whole grains and can appreciate the widespread interest in increasing intake. However, there are still challenges when it comes to evaluating products, leveraging magazine coverage, finding menu options when dining out, and preparing your clients to cruise the supermarket aisles with success. RDs have an opportunity to pass along informed advice on whole grains in all of these areas. The good news for RDs is that consumers continue to show a strong interest in whole grains. Results from the International Food Council’s 2009 Food & Health Survey: Consumer Attitudes Toward Food, Nutrition & Health revealed whole grains as one of the top three foods that respondents were likely to choose for their own health and their children’s health. Further, when people were asked to name foods or food components with health benefits, one half of the top six foods were whole grain related: whole grains, fiber, and oats/oat bran/oatmeal. Most often cited were whole grains’ protective effect against the risk of heart disease (83%) and promotion of digestive health (86%). In addition, the data show that four out of five people are trying to eat more whole grains and two out of three people are trying to reduce their refined grains intake. In 2005, General Mills committed to providing at least 8 g of whole grains per serving in its Big G cereals. Other whole grain ready-to-eat cereals available today include Barbara’s Bakery Shredded Wheat, Post Selects Great Grains with Raisins, Dates & Pecans, Cascadian Farm Hearty Morning, and Kashi GOLEAN Crunch! Honey Almond Flax. Acknowledging that breakfast cereals contribute a significant portion of whole grains to the American diet, RDs can guide their clients toward the better choices, such as those listed previously. It may also be helpful to review potential labeling confusion with clients (see Guiding Clients on Labeling Issues). The Whole Grains Council recently audited 10 national consumer magazines to answer the question: Do magazines make one half of their grains whole? Overall, the answer was no, after the council evaluated the magazines based on print mentions of whole grains in articles and recipes as well as the accompanying images. Some publications fared better than others. Four clear leaders devoted 32% to 39% of their total grains coverage to whole grains (in descending order): O, The Oprah Magazine; Parents; Good Housekeeping; and Woman’s Day. But the survey revealed that consumer magazines tend to write about whole grains more than they use them in recipes or photos.1 In other words, while they provide articles that discuss the benefits of whole grains, consumer magazines don’t always show the same amount of enthusiasm for whole grains when it comes to practical applications. It breaks the link between the reasons to consume more whole grains and the real-world strategies that help consumers put that advice into practice. To fill the gap, RDs could try suggesting ways that clients can make easy substitutions in their favorite magazine recipes, being sure to provide guidance on notable changes (eg, the greater water-to-rice ratio when substituting brown rice for white rice in a recipe). For better or worse, your clients may find themselves in chain restaurants from time to time. Helping them zero in on a menu’s whole grain choices will allow them to make better nutritional choices in the face of limited options. On the upside, some chain restaurants have revamped their menus to cater to customers interested in lighter, more healthful options, and many offer at least one whole grain menu item. Results from a review1 of the 30 largest food chains in the United States, as determined by Restaurants & Institutions magazine, found that more than one third offered at least one whole grain option. Among the top 10 chains, McDonald’s offers a line of Premium Chicken Sandwiches whose bun contains 8 g of whole grain; Starbucks offers oatmeal; and Pizza Hut offers The Natural pizza, which contains 8 g of whole grains per serving. Notable for going beyond a whole wheat bread or pizza crust were Jack in the Box with its chicken fajita in a whole grain pita; TGI Friday’s with its Dragonfire Chicken stir-fry with brown rice, which is available for any meal upon request; and Olive Garden with its policy to allow a whole wheat linguini substitution in any pasta dish. In a single-store survey1, the Whole Grains Council found that about 35% of the grain foods in a northeast town’s major supermarket were whole grain ones. Granola, hot cereals (eg, oatmeal), cold cereals, and granola bars were the four categories whose product offerings were at least 50% whole grain. However, these same categories, with the exception of cold cereal, made up a relatively small portion of the overall number of grain foods available. Overall, the largest categories were cookies, crackers, cold cereal, dry pasta, and bread. Again, with the exception of cold cereal, the preceding types of products were associated with far more refined grain foods than not. • Popcorn and 10-minute instant brown rice are also favorites of Cindy Silver, MS, RD, LDN, corporate nutritionist for Lowes Foods in Winston-Salem, N.C., as are corn tortillas. Quinoa is a popular favorite and is on Silver’s radar and that of Tyra M. Carter, PhD, RD, LD, corporate dietitian for Market Street United in the northern Texas area. • “The alternative grains are my favorite,” says Maya E Nahra, RD, LD, health and wellness educator for Sunflower Farmers Market in Phoenix. In addition to quinoa, Nahra likes to feature whole wheat couscous and wild rice. “They are often the forgotten grains; however, offering simple recipes for exciting new meals and highlighting their inexpensive prices always result in a win-win situation,” she notes. • Many whole grain ingredients contain the word “whole” in their name (eg, whole wheat), but there are others that don’t (eg, brown rice, oats, oatmeal, wheatberries). • Ingredients that are never whole grain are enriched flour, degerminated corn meal, bran, and wheat germ. • Sometimes descriptors such as “durum,” “semolina,” “organic,” or “multigrain” appear on packaging, but these terms don’t necessarily mean the ingredient contains whole grain. • When the first ingredient is a refined grain and the second ingredient is a whole grain, there’s a chance that the food in question could contain anywhere from 1% to 49% whole grain. • When it comes to whole grains, fiber is important, but it’s not everything. Fiber content in whole grains varies; in addition, some high-fiber products contain bran or other added fiber without providing much whole grain. As RDs, we can agree that getting our clients to eat more whole grains is a step in the right direction. The food industry, media, restaurants, and supermarkets can help by providing sound nutritional choices in product lines; in magazine articles, recipes, and photos; on the menu; and on grocery store shelves. And it’s RDs who are well positioned to make credible, practical recommendations in all of these areas with the goal of improving overall public health. — Maggie Moon, MS, RD, is a nutrition writer based in New York City who also works as a supermarket RD, consultant, and guest speaker. 1. Whole Grains Council. Are we there yet? Measuring progress on making at least half our grains whole. Presented at: Make Half Your Grains Whole Conference; April 20-22, 2009; Alexandria, Va. Available at: http://www.wholegrainscouncil.org/files/3.AreWeThereYet.pdf. Accessed March 15, 2010. 2. U.S. Department of Health and Human Services. Section 6: Selected food groups (fruits and vegetables, whole grains, and milk products). In: The Report of the Dietary Guidelines Advisory Committee on the Dietary Guidelines for Americans, 2005. 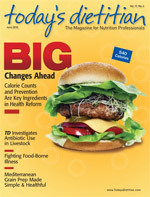 Available at: http://www.health.gov/dietaryguidelines/dga2005/report/HTML/D6_SelectedFood.htm. Accessed March 15, 2010. 3. Bachman JL, Reedy J, Subar AF, Krebs-Smith SM. Sources of food group intakes among the US population, 2001-2002. J Am Diet Assoc. 2008;108(5):804-814.